As an airline pilot and writer, I’ve been all around the world — to the skyscraper-forests of Shanghai, the grand museums of Cairo and the epic sands of the Kalahari. But what I’ve been telling friends recently is this: If you’re anywhere in Britain this August then run, don’t walk, to the Kettlewell Scarecrow Festival in Yorkshire. Kettlewell, with its friendly residents, neat houses huddled together as if for warmth, and atmospheric pubs offering local ales and real fires, is as cozy and welcoming as the surrounding landscape of the Yorkshire Dales is awe-inspiring. Looming beyond every narrow village street, it seems, are steep green hillsides that are veined with stone walls, rushing brooks and ancient, winding footpaths, and dotted with sheep who take no notice of the racing shadows of the fast-changing clouds. All that’s missing, it seems, are the crows, which may largely steer clear of a village that each August goes to so much trouble to fete the arrival of around 100 new straw-stuffed citizens. Scarecrows have a long history in England, and a cultural presence that predates the journey of Dorothy and her companions down L. Frank Baum’s yellow brick road. One of the first literary references to scarecrows came in Edmund Spenser’s late 16th-century “The Faerie Queene,” while Shakespeare and Daniel Defoe also deployed scarecrow imagery. Scarecrow festivals, however, are understood to be a modern tradition. Kettlewell’s dates from the mid-1990s, according to Nicky Fairweather, a member of the village’s pleasingly named Scarecrow Committee. Among scarecrow festivals, that’s a reasonably long pedigree. But don’t worry if this is your first such rodeo, because the basics of a scarecrow festival are easy to grasp. For around a week each summer (Aug. 11 to 19 this year), Kettlewell’s residents decorate the benches, lawns, and nooks and crannies of their village with locally crafted scarecrows. Many scarecrows are inspired by historical or literary characters. Political and popular culture figures also appear, and in this way a quiet English village raises an unlikely scarecrow-filled mirror to the global zeitgeist. Last year’s festival featured a Queen Victoria (accompanied by a sign that read, “Lie back and think of England”), a David Bowie and at least four President Trumps. 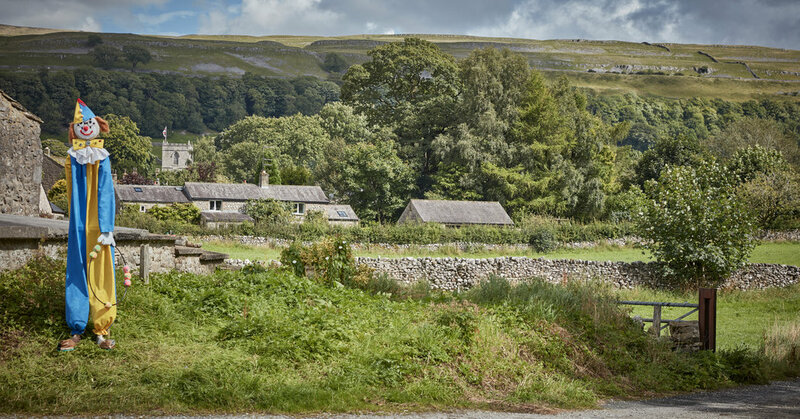 You can guide yourself through Kettlewell with a scarecrow trail map, or you can take a free-range approach, recalling picturesque lines from your favorite English novels as you cross the village’s bubbling beck, or stream. When you near the edge of the village — indeed, Kettlewell is so small that you could inadvertently wander out of it in the course of composing a long text message home — you might plan a foray into the Yorkshire countryside that’s all around you, perhaps on the Dales Way, a roughly 80-mile-long trail that runs right through the village. With or without its scarecrows, Kettlewell is a particularly fine place to indulge in a celebration of rural Englishness. Anglophiles may find themselves marveling at the names signposted on individual homes — names so quintessentially English that even the brashest American developer might pause before slapping them onto a new subdivision. My favorite house names in Kettlewell include Green Lea, Ladycroft and Fell Foot. Then there are the wooden signs that announce the distances, along a footpath, to Providence Pot (one and a half miles) and Great Whernside via Hag Dyke (two miles). When pressed about the rules that villagers must follow when creating their scarecrows, the idea, said Ms. Fairweather, is to “keep it clean.” Yet overnight, she acknowledged, “mischief-makers” might occasionally rearrange the position of a scarecrow or, indeed, two. When the sun comes up, she reassured me, her committee checks the family-friendliness of every scarecrow’s pose. It’s worth noting that a village of even the most chaste scarecrows, if not exactly frightening for the non-crows in your party, can nevertheless get a bit meta. “I am not a scarecrow,” read one sign. Early in the evening of my last day in Kettlewell an older gentleman pointed right at me, winked, and then said to his friends, “That one’s very lifelike.” It’d been a long day for me, full of scarecrows, and now it was starting to get dark. I smiled back nervously, buttoned up the straw-free cuffs of my flannel shirt, and decided it was time to go to the pub, where I found a very warm welcome.